Our colleagues in the History of Medicine unit have their annual John Ash Lecture this afternoon. 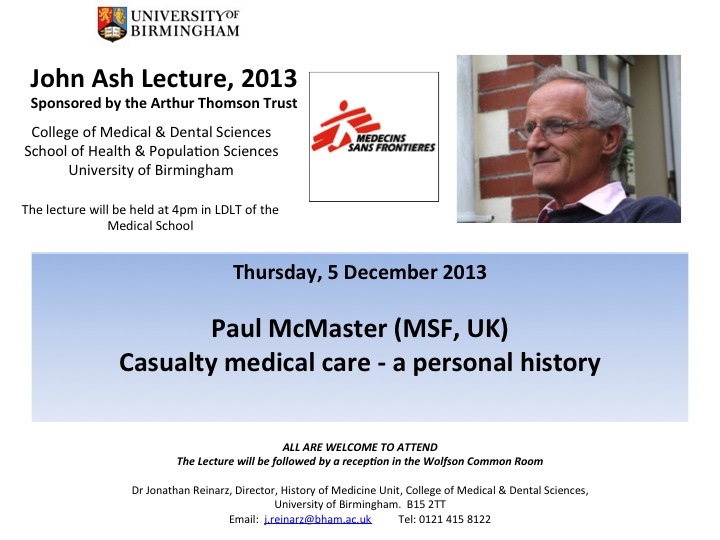 The speaker is Paul McMaster, who as well as having a long surgical career here in Birmingham has more recently been involved with Médecins sans frontières. Details are below; the lecture starts at 4pm and is followed by a reception. Our seminar speaker this week is Wendy Ugolini, from the University of Edinburgh, and her paper title is ‘Wales England Wed’: English-Welsh hybridity in the two world wars. Poster below—do join us on Wednesday afternoon.